As festival-goers and Palm Springs locals gear up for Coachella Weekend 1, YSL Beauté, the luxe-edgy Parisian brand, will open their first ever Coachella Music Pop-Up Shop, a one-stop beauty experience serving as a pit stop for those taking the trip to Palm Springs. A makeup oasis in the desert, the pop-up will serve as an interactive social media activation for consumers and influencers, where they are able to touch, feel and experience the brands new and best- selling launches, including the new Touche Éclat High Cover Radiant Concealer and Rouge Volupté Shine, which come in a range of shades. There will also be brand experts on-site who will be able to share tips on how to use some of the brand’s best-selling products. 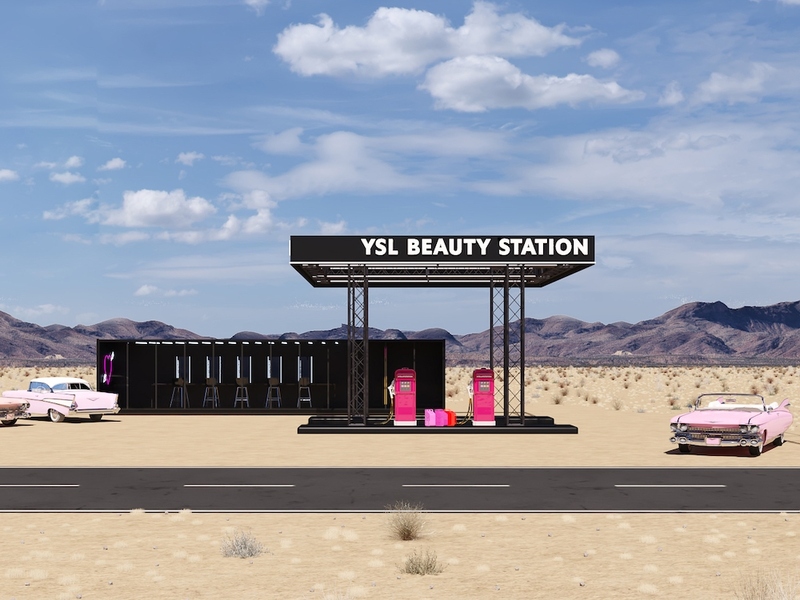 The concept is designed to mimic a refuel station, but entirely for beauty, allowing makeup lovers of all walks of life to stock up on all their needs to and from the Coachella grounds. Picture a sun-soaked California desert valley, where music lovers come to play. A dusty road, lined by palm trees; a gas station appears in a distant haze. For the very first time in 2019, YSL Beauté pushes the boundaries with a fantastical custom creation beauty adventure like no other, set in the heart of Palm Springs; a voyage to a musical fantasy comes to life. The YSL Beauty Hotel x Coachella Music Festival Pop-Up will be open from Friday, April 12 to Sunday, April 14. This pop-up is open to the public and will feature YSL products for purchase, a personalization station for your lipstick bullets and water provided by FLOW Alkaline Water.